A pause in the rain revealed this beautiful reflection in a street corner puddle. The idea for this post, the image I've had in my mind for the last year or so, is one that I cannot see in whole just yet. I feel like I keep getting glimpses of a truth, or pieces of a puzzle I haven't seen assembled but feel they belong together. The underlying theme of the ideas is the meaning of pedagogical documentation, but the big picture is elusive. It's as though when I try to grasp it, it slips through my fingers like water. 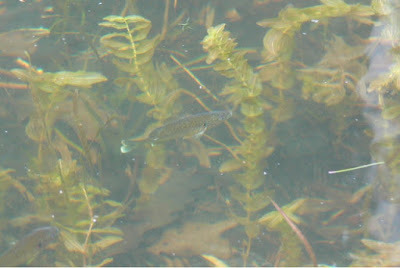 Fish hiding in plain sight in the shallow waters near the shore of Paudash Lake. Water is meaningful to me as a metaphor for so many aspects of life. I grew up with a fish-stocked pond which was wonderful for swimming in summer and skating in winter. We spend hours watching the goldfish darting about in the reeds, catching tadpoles, listening to frogs, or spying on the occasional great blue heron who'd dropped in to stalk the fish. I learned the names of the lakes and rivers we passed on our semi-annual trips up north to visit my mom's family in the Timmins area, or south to Philadelphia to visit my dad's family. Some of my fondest childhood memories involve faraway lakes (visiting family friends on Temagami) or nearby shores (the miles of shallows north of Gilford on Lake Simcoe). In my twenties I traveled across the province, visiting the far corners and near towns that I didn't yet know - Thunder Bay, Kenora, Ottawa, Lindsay, Port Perry, Sudbury, and many more. I've loved learning the many moods of water, from the stunning morning reflections on a still pond, to the deafening roar of a waterfall, to the eerie creak of a frozen lake singing beneath the ice-fishing huts. 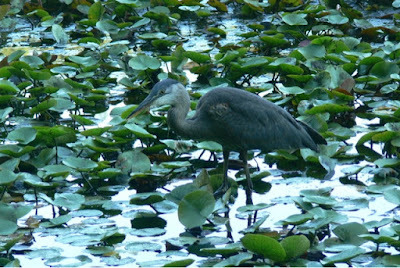 A great blue heron stalking prey in beautiful Stanley Park's Beaver Lake. Ducks were skimming the water's surface nearby while this enormous bird stood still for minutes, watching for movement below the lilies. Many definitions of pedagogical documentation speak about how it makes the learning visible. Documentation is sometimes likened to a mirror: reflecting what is, but also allowing one to see what is missing. As a metaphor for seeing, looking in water is not "true" reflection but moving, showing life below the surface and mirroring differently as the ripples move... searching for self but seeing much more. This makes more sense to me - learning is a social activity heightened by the questions and discoveries of those with whom we are engaging in exploration. Learning is never static, for new ideas bump up against those already held and they require us to reorganize our thoughts to make sense on a daily basis, in an ongoing process of cognitive dissonance and reckoning. It is not a mirror, holding steady on the wall, but all around us as awareness. For this reason I come back to water to understand reflection. Water changes to suit its environment. Our thoughts likewise change and reflect the ideas we hold, and as such can not be thought of as a "true" reflection of what has happened, but instead an impression formed from our particular perspective. 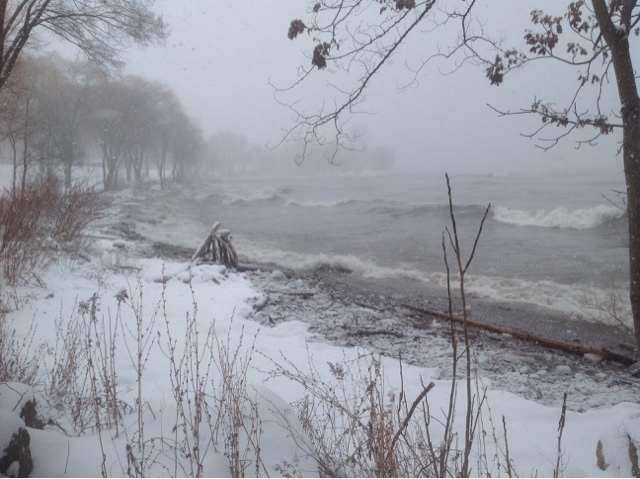 A typical winter view on Long Branch beach - waves undulate below a layer of glistening, tinkling ice. Learning a fact or a skill can be seen as a complete task. But most learning in life, and indeed in a multi-age, emergent curriculum classroom, is a much messier affair with some deep meanings taking many turns around and around the concept before any understanding is possible. Indeed, my very attempt to define documentation is causing me to spiral around the the concept. For that reason, I invite the perspectives of those educators around me whose documentation has inspired me, and helped me to look closely at my own practice. A blustery day on Long Branch beach. One can feel the spray of the waves far back from the water's edge. Below is the moment I captured when these images began to swirl, much like a whirlpool, connecting various people whose work with documentation excited me. This storify, now six months old, lead to the first of my guest posts on this idea, as I was revisiting the documentation story that lead to Christie's post. Today I came back to create an introduction to the second guest post, by Nadine Osborne, and discovered this artifact (the storify) saved in draft with only the title and the hope for more guests to join in. Please note: in order to see the entire story (embedded below) you will need to click on the blue "read next page" banner. This post will be edited to add the live link for Nadine's post, which is currently in draft form as well. Final thoughts - I left myself the trace (the storify link, and the title) and nothing else. 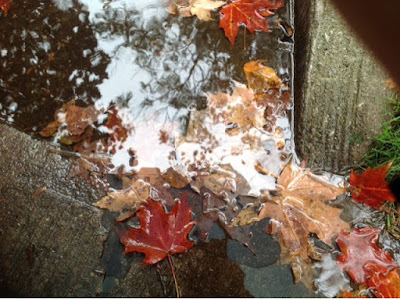 Why "reflections on a stream" and not on water, or a pond? I honestly can't recall my thinking from that day in September when I created a draft and then got caught up in the swirl of a new school year. What I see now is this: when you seek reflection upon a stream, what you see doesn't appear to the others around you exactly as it does to you. Much depends upon where you stand. Your documentation is a trace of the relationship between you, the learning, and the other learners. 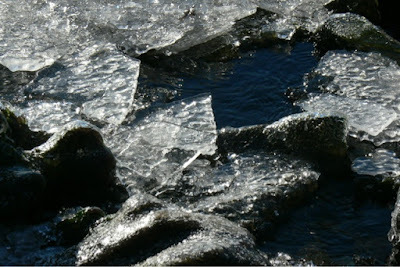 What you remember will be what touched you, or caught your eye like the flash of sunlight reflecting on water. Laurel - my circle of learning just grew like a puddle receiving warm drops of rain. Thanks for linking me to Cassandra, Janet, Christie through your blog. I just followed three more shining lights on Twitter! Laurel so exciting to see how you have slowed yourself down to study and relect on documentation, its process and its intention. C. A. Wein invited so many of us to do so and with good reason. I marvel at your passion for this work. You glisten. Nadine, I'm so glad - my favourite part of this wonderful social media experiment is getting people together - when people inspire me, I know they'll inspire each other, too. Now I'm just finishing the intro for your post. I love your story! I was speechless a moment there. That means a lot coming from you! It is indeed a journey, learning about teaching and my role in it.